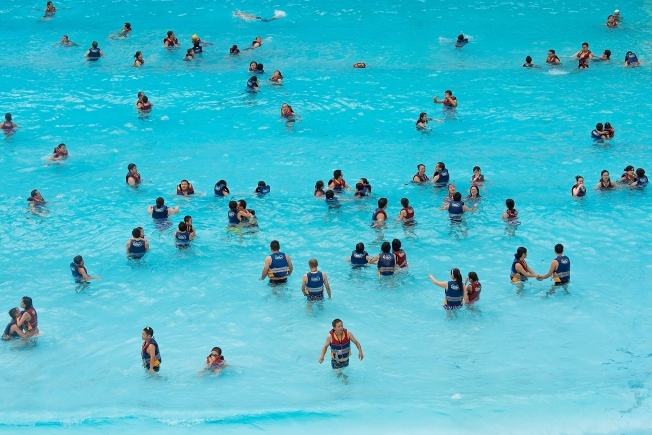 Generic image of people in a wave pool. Note: Pictured is not the wave pool at Water Country. A Massachusetts man is suing a New Hampshire water park, claiming he nearly drowned in a crowded wave pool. Gregorio Ortega-Mejia of Haverhill filed the suit last month against Water Country, according to the Union Leader. The newspaper reports Ortega-Mejia claimed he became submerged at the bottom of the wave pool for a "lengthy period of time" on July 26, 2014. The suit accuses the Portsmouth park of not having a sufficient number of lifeguards on duty to monitor pool activity, says the paper. The suit also claims Ortega-Mejia was rushed to a local hospital where he was treated for hypoxic brain injury and other injuries.